Like you, we believe our community can be a better place to live for individuals with disabilities. Imagine a more accessible community with more opportunities to recreate, socialize, volunteer, and be gainfully employed. Our community can be a better place to live for individuals with disabilities but big picture system-level change does not come easy or quickly. Achieving a bold vision often means taking actions today that may not yield results for generations. The Barbara Stone Foundation is committed to supporting efforts focused on long-term system change for individuals with disabilities. Equitable Opportunities: Individuals with disabilities flourish when community, cultural, and organizational systems and policies ensure equitable opportunities for all. Equity ensures individuals get the support they need to participate fully in our society. Unfortunately, individuals with disabilities continue to be underrepresented in common areas of community life including employment, recreation, arts, sports, and civic engagement. The Barbara Stone Foundation pulled a cohort of service providers and stakeholders together in 2013 with a belief that working together would improve outcomes for individuals with disabilities. This collaborative effort grew and is now call Greenville CAN (Collaborative Action Network). 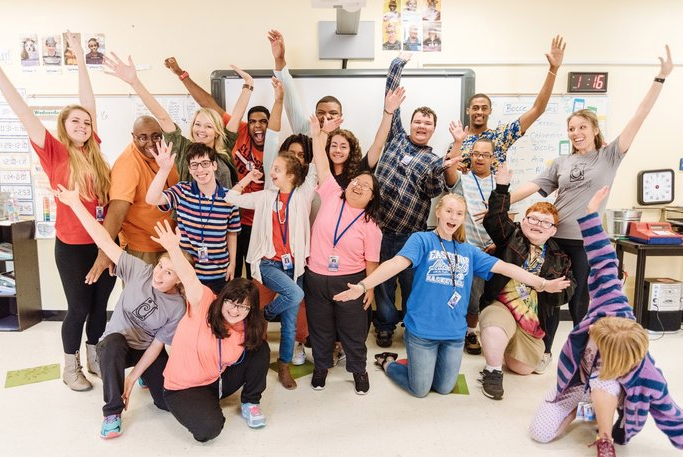 Greenville CAN is not a formal organization; instead, it is a coalition of self-advocates, service providers, families, caregivers, and professionals committed to making Greenville a better place to live for individuals with disabilities. The Foundation has provided financial support for Greenville CAN since 2013 and made the decision in 2018 to serve as the official home for the Greenville CAN coalition providing additional financial and staff support. Click Here to Learn More about Greenville CAN and How to Get Involved. Innovative programs that empower individuals with disabilities and enlighten our community are the building blocks of a community where individuals with disabilities flourish. Every time a child without a disability plays alongside a child with a disability at an inclusive playground, for example, it gives them a more accurate perception of people with disabilities. Inclusion fosters acceptance and understanding through increased awareness. Your contribution invest in innovative programs that empower individuals with disabilities and enlighten our community. Below are some examples of programs previously supported. Deficit of Community Based Programs for Young Adults with Intellectual Disabilities: Based on research the Foundation conducted in 2013, the is a significant drop off in services, programs, and opportunities for individuals with disabilities once they become adults. The Barbara Stone Foundation provided funding to help the YMCA of Greenville start the RECESS Program. During programming, participants learn about nutrition, fitness, social responsibility, community outreach, and independent living skills. RECESS allows adults with diverse abilities not only a place to continue to learn new skills, but also gives them a place to connect with friends and gain a sense of belonging. Click Here to Learn More about YMCA RECESS. Deficit of Inclusive Arts and Recreation Opportunities for Individuals with Disabilities: There are thousands of opportunities for people without disabilities to participate in arts, sports, and other recreation activities; however, there are dramatically fewer opportunities for individuals with disabilities. Meeting this need through disability specific program only is not a sustainable solution. Inclusion creates an immediate and sustainable increase in opportunities. Unfortunately, many providers do not know how to make their programs inclusive, or are hesitant to do so. Invest in innovators willing to lead by example. The Barbara Stone Foundation provided funding and support to the Carolina Dance Collaborative. The Carolina Dance Collaborative is a mobile dance outreach organization. Instead of having their own studio, they collaborate with other local organizations, schools, YMCA’s, and disability organizations, as well as, group and senior homes and bring their dance education classes directly to their facility. They also started an inclusive Adaptive Program and their example is demystifying inclusion for other providers. Click Here to Learn More about the Carolina Dance Collaborative. Society’s limited awareness and understanding of individuals with disabilities: People without disabilities often cannot see past a person’s disability to realize that they are more a like than different. This lack of awareness leads to inaccurate stereotypes, limiting assumptions, and decreased opportunities for individuals with disabilities. Invest in in an aspiring new film maker with a story to tell. When Sarah Shoemaker approached the Barbara Stone Foundation for support for her documentary film, she did not have a long resume of film making experience. She did have a great story to tell; however, about a dance instructor and an unlikely troupe of dances with disabilities. Sarah’s film, Invitation to the Dance, thoughtfully weaves together the stories of five students together in a way that helps us realize all people with and without disabilities are more alike than different. We all have dreams and aspirations, and a few of us love to dance. Click Here to Learn More about and view Invitation to the Dance.